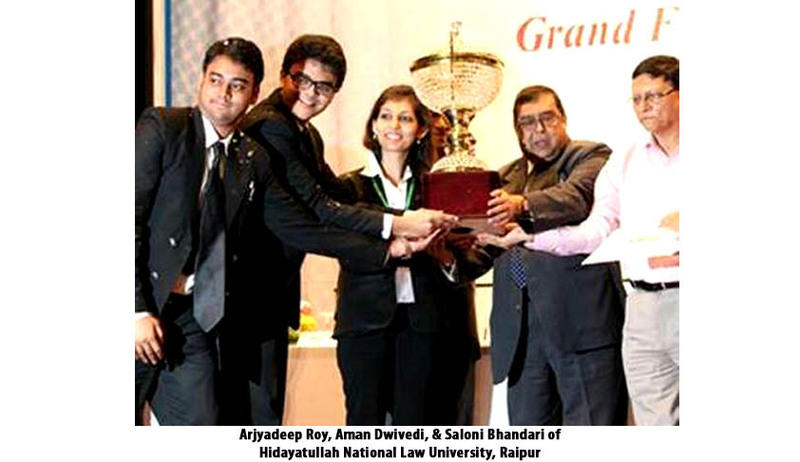 Arjyadeep Roy (4th Yr), Aman Dwivedi (4th Yr), & Saloni Bhandari (4th Yr) of Hidayatullah National Law University, Raipur were the Winners at 2nd KIIT National Moot Court Competition, 2014. The Moot was organised by KLS, KIIT University, Bhubaneswar, Odisha. Live Law: Dealing with two Moot Court Problems in a single Competition and coming out as winner, how does it feel team? Team: The most challenging part of this competition was the fact that we had to simultaneously research on both the problems which involved intricate and issues of tax and corporate law. Since, the competition involved two propositions, changing our oral submissions overnight was a very difficult task. Live Law: The first problem was based on taxation law and second on the recent SEBI v. Sahara Case. What was your approach during the research and whether it came out exactly the way you guys thought or during the Competition you guys changed your strategy? Team: In regard to the first problem which encompassed the contemporary issue of taxability of ‘payments in lieu of software’, we had prior experience over the intricacies involving this subject. Thus, preparation of memorandum for the first problem was comparatively an easier task as compared to the second problem. The second problem was based on SEBI v Sahara Case. Firstly, we all read the judgment rendered in the case to be completely aware of the law point. We read the SEBI order, the SAT order and the final Supreme Court judgment to exactly know the law points involved and then based our research on similar premises. We made exhaustive research on all the law points thereafter and prepared the memorandum. During the oral rounds, we stuck to our arguments, although we adapted our arguments according to the questions that were posed. Team: Generally, it is advisable to stick to the line of arguments as prepared. But then, there should be enough flexibility to understand the questions of the bench and frame the argument at the time of oral submission in a way which is satisfying and convincing to the bench. The essence of the argument should remain the same, although its presentation can be changed according to the questions and the counter arguments furthered by the opposing team. Team: We have worked as a team before in other moot court competitions and what we believe is that the compatibility in a team is of utmost importance. Thereafter, a healthy discussion among all the members and a proper coordination is required to become a successful team. Team: Overall the competition was of a high standard as all the teams we came across were really good and well prepared. The level of judging in all the rounds was great and the experience of arguing before a Constitution Bench presided by Hon’ble Ex CJI-Altamas Kabir was indeed exemplary. We faced 5 teams in total up till the finals. In the prelims, we faced BVP, Pune and NUJS, Kolkata. In Quarters, we faced Fergusson Law College, Pune. We were up against NLU-Orissa in the semis and RGNUL, Patiala in the finals. The toughest round we faced was the finals against RGNUL, Patiala. Their research was great and presentation was of a high standard. All in all, it was a tough competition against them. Team: We just went in with one mind-set to give our best in all the rounds and take each round as it comes. Team: We were confident about our preparation from the outset and had the self belief that we had the competence to perform well in the competition. We also did not want to get ahead of ourselves and the idea of winning the competition only dawned upon us after the final round results were announced. Live Law: How was your all round experience of the Moot Competition? Team: The overall experience of the competition was very good in terms of the quality of the participating teams and the judging level. The organization was also of a high standard; further, we would also like to thank Nikhil Ranjan, our team representative, from KIIT who helped us a lot and made our stay comfortable. Team: For us arguing in a packed auditorium in front of Hon’ble Ex CJI-Altamas Kabir, Justice Pinaki Ghose of Supreme Court of India, Justice Narayan Chandra Sil of Calcutta High Court and Justice A.S.Naidu and Justice B.P.Das of Orissa High Court was indeed an overwhelming experience in itself. We think that what made us get success in finals was our exhaustive research, spontaneity and overall presentation. Team: Personally we feel that both the teams were equally good but then it is for the judges to exactly point out the difference between the two teams. 3) Team work- BVP, Pune. Team: We would like to tell them that participating in a moot court competition is a thrilling experience and one gains a lot from it. Moreover, researching on an issue in a moot court competition helps you get the maximum amount of knowledge about the particular law point as it involves thorough research and healthy discussion. Well thank you so much Team. We wish you all the Best for your Future.